Ah, Tea! It is the world’s most acceptable beverage and second most popular drink. Tea works in every situation – be it cold, sitting down to work, to cheer someone up or as a medicinal remedy. Tea too has strong social and cultural connotations and is a sign of hospitality, worldwide. China is the largest producer as well as consumer of Tea and Sri Lanka ranks fourth in the production as well as export and its consumption is far less. We all know about the different varieties of tea – black tea, green tea, herbal tea but have you heard about Virgin White Tea. It came as something new to us and now exploring the Virgin White tea estate and tasting virgin white tea was high on our list. One fine day, after breakfast at Apa Villa Illuketia in Sri Lanka, we took our bike and rode to the south coast of Sri Lanka to explore more dormant villages and the virgin white tea estate, Handunugoda at Ahangama. The Virgin White Tea estate, Handunugoda is a family owned plantation of planter Malinga Herman in Tittagalla, Ahangama. In fact, this is the only tea estate that is so close to the sea in the whole world. 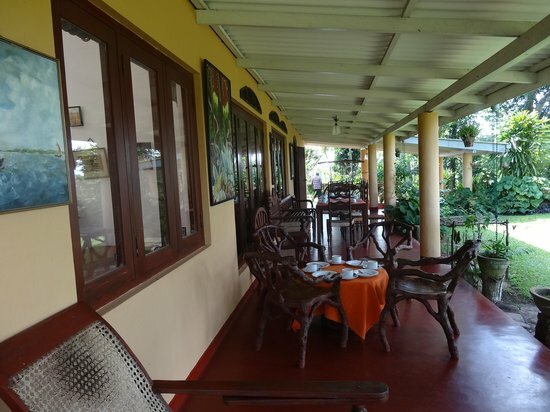 It lies 160 km from Colombo; 24 km from Galle Fort; and 6 Km inland from the main highway nestled between the evergreen forest and the vast Indian Ocean. As we arrived at the estate, we could see women dressed in coats and plucking the tea leaves and there was a continuous music by birds in the plantation. The briefing about the estate began by plantation guide in minutes and this is how he went about the property. The total Handunugoda estate is spread over 150 acres, out of which 75 acres is only of tea and the balance 75 acres is of rubber, cinnamon, and coconut. The estate is not a mass producer of Tea but produces the only choicest collection of tea that matches International Standards. 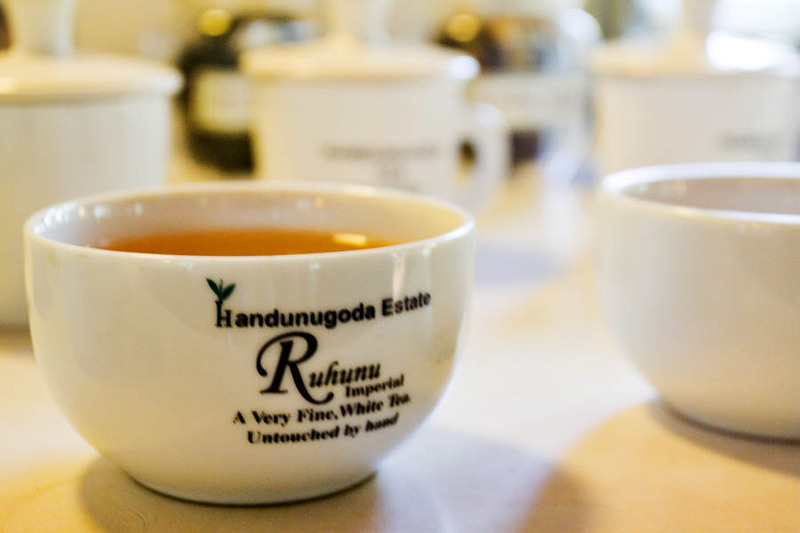 The Handunugoda estate manufactures 5 categories of tea: Black Tea, Oolong tea, green tea, white tea and Herbal infusions. To us, the most attractive were Virgin White Tea, so let’s start with it. 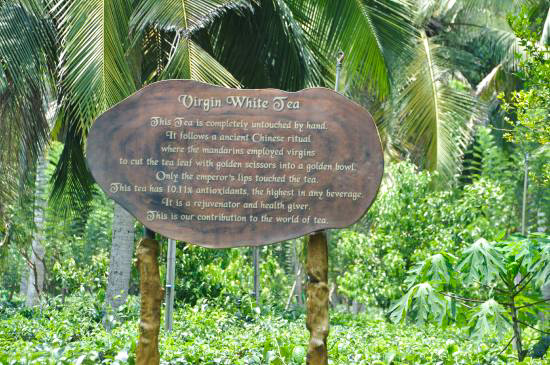 The Virgin white tea estate produces Virgin white tea, completely untouched by hands. The white tea leaves here are harvested, following the Chinese rituals. In the ancient era, the Chinese emperor Tsong and Tsang used to deploy the virgins to pick the leaves wearing white silk gloves, with a golden scissor into a golden bowl. The virgin white tea never touched the bare skin until it touched the lips of an Emperor. This high tea was only for the emperor and served to the rulers and dignitaries. The Handunugoda estate still mimics this tradition except that the virgin concept now applies only to the tea and not to the pluckers. After explaining this; he kept on walking ahead and we were still lost in the leaves and his confident words. Virgin White Tea is unique and it requires minimal processing. Each step while processing is done with special attention and care. At dawn, as the first sunlight hits the tea estate, the unopened buds are carefully picked by tea pluckers in the bowls and placed in silk pouches. After plucking, the buds are spread over black flannel trays and are dried only using the filtered sunlight. When the bud dries completely, it is packed delicately in air tight containers using the soft gloves. Isn’t that interesting process for royal tea? The Black tea is manufactured after series of eight steps and the equipment used in the estate is more than 150 years old. 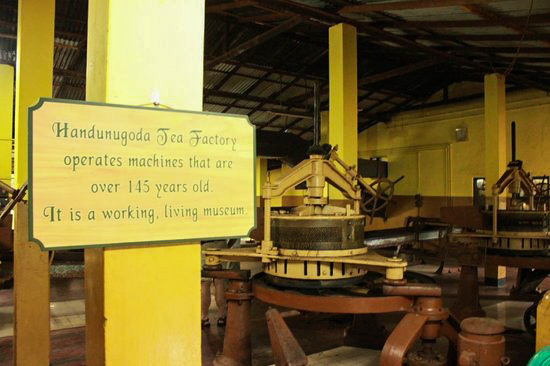 So, Handunugoda estate is also referred as a Living and Working Museum. The process starts by plucking bud and tender leaves by hand and this is termed as Fine Plucking. 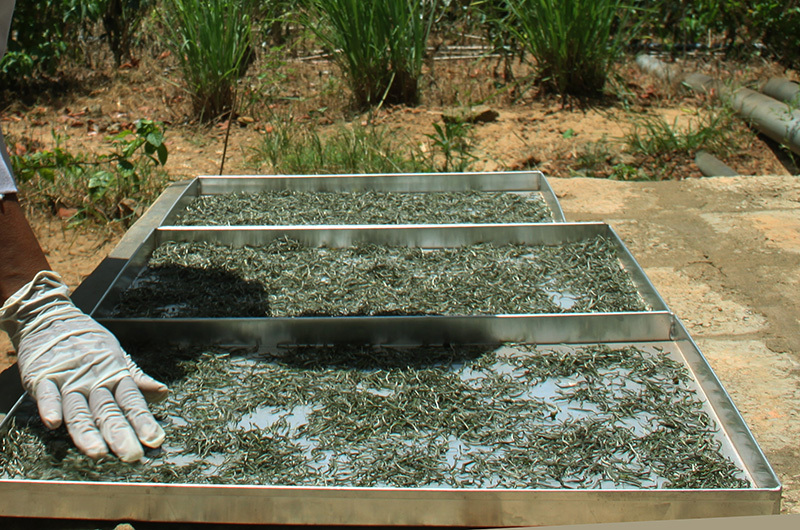 Then, the leaves are sorted to remove the coarse mature leaves, as they can affect the quality of tea. After sorting, leaves are withered by cool air to reduce moisture content. Withering make them more pliable and also activates certain elements in the leaf which are essential for quality tea. Next, the leaves are rolled. Rolling is performed at fixed room temperature to bring out the flavors of tea. It also gives the curved appearance of tea. After rolling the leaves turn golden brown and are further put to fermentation. The fermented leaves are called Dhools. Next, the leaves are Dried by conditioned air to reduce moisture content and deactivate fermenting enzymes. From here, the tea is further moved for grading. The last step Packaging at Handunugoda is still done by hands in air tight containers. 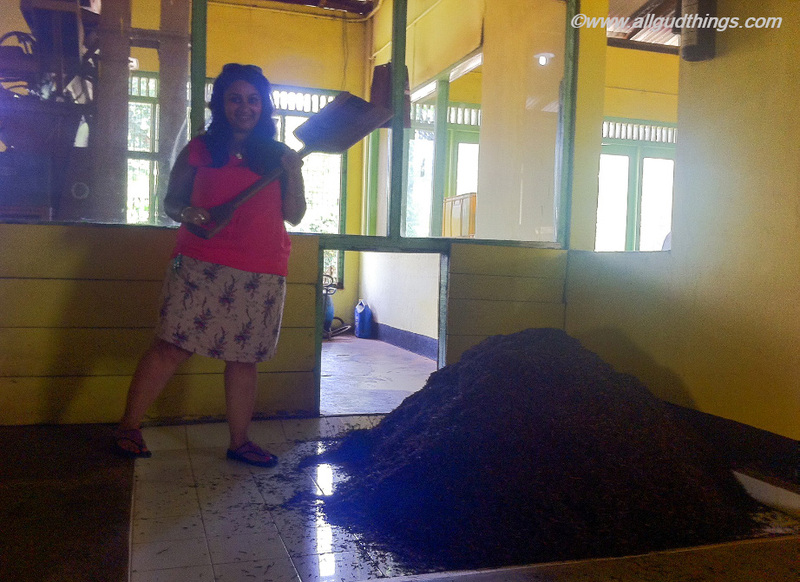 The average plantation worker picks 25 -30 kg of Black tea leaves in a day whereas, at Handunugoda estate, a damsel only picks 150 -160 grams of virgin white leaves in a day. That means 3.5 -4 kg in a month and 48 kg in a year. White tea is delicate in flavors and aroma. White tea has 10.11% antioxidants, highest of all the teas and other beverages. So, it is the healthiest tea in the world. Apart from this, white tea has many medical benefits. It is rich in vitamin A; reduces inflammation; prevent eye dryness and night blindness. Virgin white tea is also one of the most expensive teas is the world. Usually, it is sold at a price of $1500 per kg. Mariage Freres International situated at Faubourg Saint –Honore in central Paris is the only Tea Salon to stock this Herman Virgin White Tea. The one teaspoon of exquisite white tea can make 3-4 cups of tea. Visiting tea plantations and getting lost in the lush terraced landscapes is what we had dreamt of. But we never knew we will have step back into the colonial times along the coastal belt. 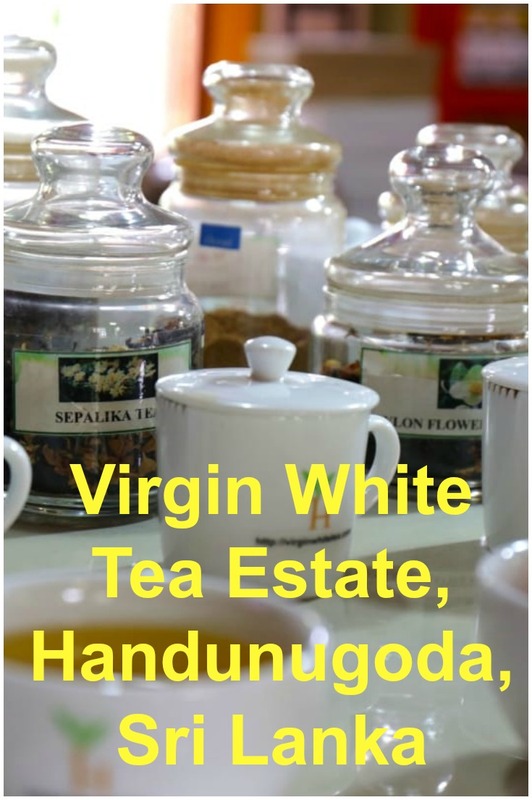 We had one of a kind experience visiting Virgin White Tea estate, Handunugoda, and factory. The session was followed by a tea tasting along with chocolate cake, in the owner’s bungalow verandah and it was good enough to seduce our senses. 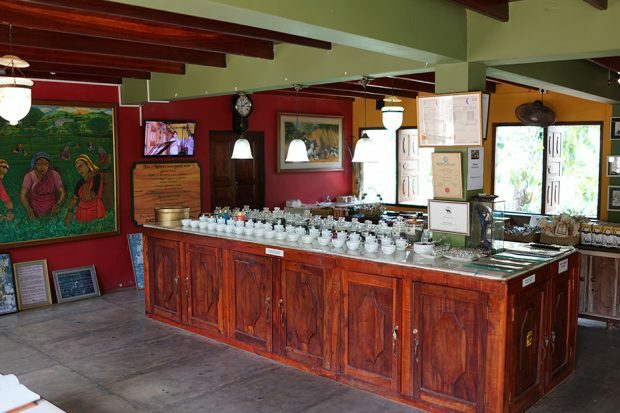 Apart from this, there is a tea museum within the estate where one can taste almost 50 varieties of tea including virgin white tea and shop them from the tea shop. We highly recommend Virgin White Tea, Pure Lemongrass, and Rainforest tea, if you are willing to purchase. Climb upstairs from here to have a peek into old pictures and paintings on the walls and to have a panoramic view of a plantation. Contact Details: Handunugoda Tea Factory, Tittagalla, Ahangama, Sri Lanka. 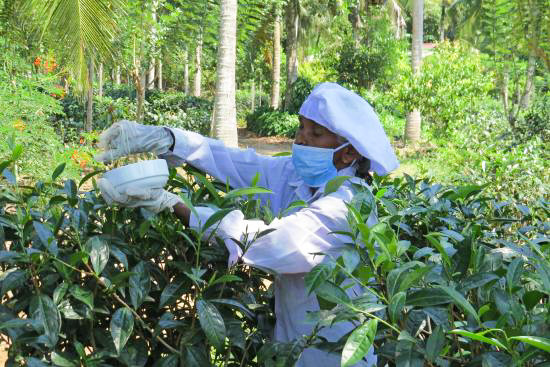 Note: The Handunugoda or Virgin White Tea estate at Sri Lanka, offers a free guided tour of the plantation and factory, along with tea at the end of a session. And if you are a book lover, then do buy Herman autobiography- The Suicide Club: A Virgin Tea Planter’s Journey, which is highly entertaining and has great insights about his life, tea, and Sri Lanka, from the waning days of the British Raj to today. We feel the visit to Virgin White Tea Estate was quite interesting if you too feel so please share it with your friends. wow – virgin tea! i had never heard of it and the process you were able to witness sounds amazing. I love that there are processes like this full of tradition and custom. Thank you for sharing. Never heard of virgin tea! Sounds interesting. Lovely pictures. This looks really interesting! I love tea, so it would definitely be something I’d want to do if I ever visit Sri Lanka! I’m a huge fan of tea! Thank you for writing such a great and informative overview of Virgin White Tea. I would love to visit the Estate one day! I don’t know why, but i’m a huge fan of tea. I just like the soothing smell that it provides whenever I get to drink one cup. I have long been planning to visit a tea plan and this one is surely on my list of places to visit if I get the chance to visit Sri Lanka. Thank you so much for sharing this with us. how does the virgin tea taste like? Sri Lanka is an interesting place to visit. Someday i’d go there. I personally liked it but lemongrass goes to my favorite category. A tea garden so close to sea is unimaginable. The tea definitely will have special flavors. I have tasted white tea… loved it too but Darjleeng Tea remains my fav. What a great post. I knew there was lot that went into making some kinds of tea, but didn’t realize that some people take it to such an artistic level. Sri Lanka is just fabulous and full of surprises. I can’t wait to go back. It sounds like you had a very good and interesting day. Sri Lanka’s tea is delicious and I am not even a tea drinker. We visited the tea plantation near Lipton Seat while we were there and also enjoyed it a lot. A lot of work going into the all process. Great photos! It’s such a wonderful feeling visiting tea estates..isn’t it. The fresh aroma of the green leaves of teas from the fields first fill us up. And then add to that the scent that arises from the units where the tea leaves are processed. This brought back my own memories from the tea estates of Darjeeling. Really, it filled up our senses in every way and tasting the most expensive tea in the world was also a experience in itself. Really, it filled up our senses in every way and tasting the most expensive tea in the world was also an experience in itself. What an interesting concept. Tea picked with golden scissors….. I wonder if it made s a difference to the taste? What a great post! What an interesting concept. Tea picked with golden scissors….. I wonder if it made a difference to the taste? What a great post! Tea plantations, as well coffee plantations, are fascinating to me. How they work, how they fit into a landscape. I don’t even drink much tea and never drink coffee but I love the concept of these sort of places. Really interesting post, Sri Lanka is on our wishlist. We are hoping to get there in 2018. I have enjoyed silver tips tea before and thought at first that this might be a variation but as I read more, I realised it’s a unique idea all about the lack of touch of human skin on the tea leaves, until the consumer makes and drinks the tea. What an intriguing tradition! The plantation looks beautiful to visit and love that you can do a comprehensive tour, and the museum allows to learn more history. One to bookmark! Perfect timing as I am currently working out a itinerary for Sri Lanka as I am visiting in September. I think I will add this to my list of things to do as I love tea and would like to find out more about it and of course drink a few cups. Despite being such heavy tea drinkers, I’ve visited several coffee plantations, but never a tea plantation! It looks a beautiful place, it would have been lovely to have sampled a freshly brewed pot! I’ve never known what exactly white tea is, and had no idea there was sort of an untouched higher version of it. Higher antioxidents sounds like a bonus. But one thing you should put more detail: the taste! How was the stuff? Considering the price, it must be brillant. I love teas but I never tried a white tea before. Their process is truly delicate and I can imagine the smell and aroma of those dried tea leaves. I can honestly say I have never explored a tea farm or how its made. Guess in the States Tea isn’t a big deal but I would love to explore how the white tea is made in Sri Lanka cause I love white tea! So many teas! What teas did you like the most? The process of making tea is interesting :). My favorite is Lemongrass and Rainforest. And Virgin White Tea was definitely special. I’m usually a black tea fan, but there’s always room to try something new. Especially if it requires me to visit a country that I’ve thought about visiting for awhile. Oooh that’s so much info on tea! Though I am not a tea person but the info was just too intriguing. I had a lovely experience at a number of tea plantations in Sri Lanka. This post revives such good memories. I especially loved the choco-swept cakes with cream they served with tea. The taste still lingers . 🙂 I had no idea that white coffee actually has 10.11% antioxidants. That’s quite a high percentage. Cheers!! YOu have really great photos! Also now I know why it’s named virgin! What an odd story and an interesting one at that. It’s quite fascinating to know about its history, that it used to be just for the emperor and the leaves had to be picked by virgins? It really makes me interested when I hear stories like this, makes you realize just how much time has changed. 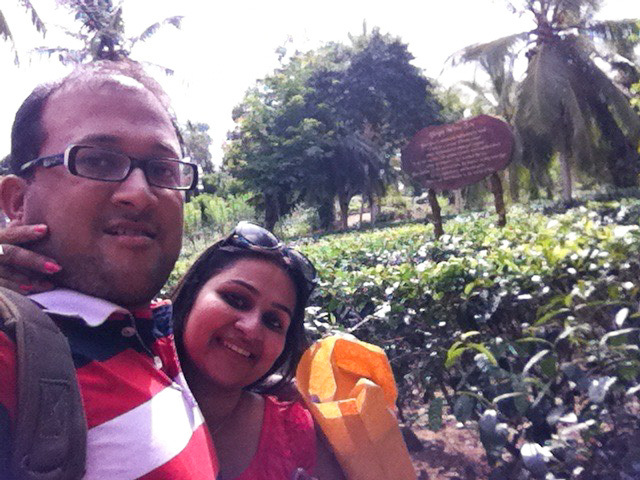 Visiting a tea plantation seems like an appropriate thing to do while in Sri Lanka. I love the highlands of Sri Lanka – so serene and the tea plantations are really interesting to visit. Your post reminds of our visit to the tea estate in Kerala it is an amazing experience to walk through their processing and finally sip cups of hot tea. The story of white tea is new to us but very interesting. Thanks for sharing this with us. This place is so serene and beautiful. Love taking a stroll in a tea estate. We are heading to Sri Lanka next week. This post is making us so excited! As tea lovers, we would love to visit! Chocolate cake with the tea sounds like heaven. Wow, what a really interesting experience – I knew that tea plays a big cultural importance in Sri Lanka, and that visiting a tea plantation is one of the top things to do, though I hadn’t heard of virgin white tea before. I can understand why it’s the most expensive tea in the world when what they pick of Black tea in a day is a whole year of virgin white! Really fascinating history too, that the Emporer would only have the process under taken by actual virgins. Also very interesting that it’s the most natural tea and never touches anyone’s hands. Thanks for sharing your experience and insight! Oooh. Im a bug tea drinker myself! Would love to see this process from start to finish, would be so interesting! This is my perfect day out! I’m such a tea fan. I always carry a big bag full of tea and herbs to make fresh teas in my backpack. I would love to visit one day and do something like this. Can’t say I’ve tried virgin white tea but now I cannot wait to! It sounds absolutely beneficial to so many health factors! Oh my goodness, this looks pretty incredible. I’m a huge tea fan and I’ve started getting into different types of tea lately. This trip looks like it would be right up my street, take me with you next time :)? I have heard a lot of wonderful things about Sri Lanka! I’ve never heard of this tea. But I do love to drink bag tea so this was very informational. I’ve never heard of this tea. But I do love to drink bag tea so this was very informational. Thanks for sharing the process. I would have been SO excited! I love tea so much. I drink several cups a day. Looks like you two had a great time! I’ve never heard of virgin white tea. From the entire process of making this tea, it sounds like a must try for tea lovers. I’m sure it would be that good. I’d love to visit this tea estate once when I’m in SL. I am a tea lover and I wonder how virgin white tea differs from any other teas around? It’s a very informative post. I never been to a Tea Edtate though alwaysalways wanted to, but you showed a great pic of tea gardens. This post gives details about how TEA is processed . The trip looks amazing! It makes me want to try white tea. It’s always so interesting to learn about the processes of very common household items, like tea! I think that makes enjoying the product even richer, because you can appreciate where it comes from and how it got to you. What an interesting article! I have just learnt so much! I am a tea lover through and through. I rarely drink anything else, but I have never visited a tea estate, it looks like a wonderful experience. Wow! It looks like you had such a great trip! I’ve never been to Sri Lanka, but I do have trips planned to Hawaii this year and England next year! I’ve never heard of this but it looks like such a fun experience! Always love tea gardens and tea estates. They are so enchanting and never fail to fascinate us with their beauty, be it in Darjeeling, Assam, Ooty or Sri Lanka. 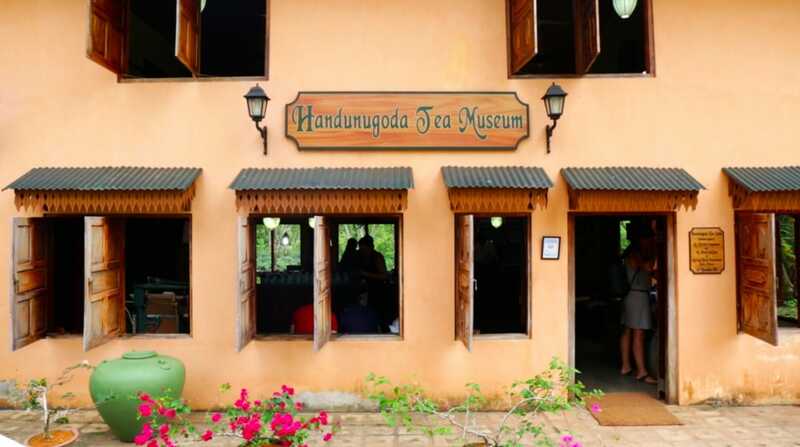 The Handugonda tea estate looks like a nice offbeat destinantion to visit in Sri Lanka. I love the fact that there is a tea museum too. Hope to get there whenever we plan for Srilanka next time. What a experience to visit a tea plantation! I didn’t know that there are places such as this one harvest tea leaves with gloves. I learned something new today! Would love to taste this in the future! Ha ha, love your first line that tea is the most ‘acceptable’ drink going round. Being a coffee fan myself I’d have to go the bean over tea leaf but still virgin tea sounds great. Such a random history behind it. Thanks for sharing! This is a really interesting article. So interesting to read about Virgin White tea. A good cup of tea is perfect and this tea sounds incredible. What a fun tour and experience. Did you get a chance to sample it at all? Yeah you can taste of all these in the tea museum. I absolutely love tea and I’m heading to Sri Lanka next spring. This sounds like a really unique tea experience I’ll have to check off my list! Thanks for sharing! What an interesting story behind the virgin white tea 🙂 And seems like it used to be a very costly affair. Not virgin white tea, but I did get a chance to try white tea during my stay at a tea estate near Conoor. The tea was named so because the tender tea buds ( which happen to be white in colour) were plucked even before leaves could come out of them and this collection happened only during foggy winter mornings. Really Interesting and new to us. Never heard of this before! My wife and I love tea and will surely check it out when we get to visit Sri Lanka. Thank you, very informative. White Tea is probably my favorite kind of tea so this looks like a great experience. I didn’t realize that virgin white tea meant untouched by human hands. Interesting. It seems like you had a fun unique visit to this place. Thanks for the information! I like your blogs. Very Interesting and Knowledgable. So much tea. I would be in heaven here. I am huge tea drinker and love trying tea from the places where it is grown. I love how much of the tea process is still done by hand.